&Beyond Nxabega Okavango Tented Camp offers a wild game viewing experience of Botswana’s lush grasslands with luxury accommodation in nine tented suites. Rugged yet luxurious, remote from any human encroachment in a beautiful natural setting with comfort and style. Positioned to explore the magnificent Okavango. The wide open channels of the Delta spread in front of the camp, inviting guests to discover a world full of adventure. The Camp is known for its elegant tented accommodation with breathtaking views of the ever-changing Okavango Delta. &Beyond Nxabega Okavango Tented Camp is an ideal place for wildlife lovers who want to experience a water and wildlife adventure between the lagoons and channels of the Delta and the Okavango floodplains and from the same base explore the Nxabenga wilderness on day and night safaris, bush walks, mokoro and powerboat cruises (mokoro local lingo for a canoe formed by hollowing out the tree trunk in the form of a canoe). The wide channels of the Delta spread in front of the camp luring guests to discover a world full of adventure. Tucked under a canopy of massive ebony trees, &Beyond Nxabega Okavango Tented Camp reveals the splendour and variety of the Okavango in all its glory. Sheltered by dense forest thickets, yet opening up onto wide, expansive views over lagoons and channels, the Camp showcases the best of what the Delta has to offer. Nine exclusive tented suites are strung out on either side of the camp's handsome thatched guest areas. Raised on wooden platforms, the spacious tented suites let in the sights and sounds of the African bush. Escape the heat of the day with a dip in the pool or take in the sun on the broad viewing deck looking out over reeds and floodplains. Cowhide rugs on the floors and chocolate tones warm and gratify, while large spinning fans keep the heat at bay. A large ensuite shower with burnished teak floorboards refreshes and renews, while private wooden decks invite you to contemplate the water’s edge. Sweeping guest areas nestled under shady boughs provide a cosy place to while away the afternoon hours. Gaze onto distant views or take refuge in dark wooden panelling and leather fittings beneath the steep thatched roof. Gleaming wooden floors and comfortable reed chairs under a blazing chandelier add spice and warmth to meals served in the gleaming dining room, with wide open doors pulled back to stunning Delta views. 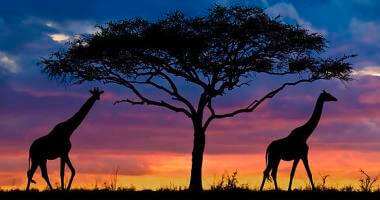 Nxabega means 'place of the giraffe' and these elegant animals are abundant in the surrounding areas. Families of hippo hide in the deeper channels and lagoons while the cries of Fish Eagles fill the sky The Okavango Delta is home to a large number of species, including semi-aquatic species, such as the red lechwe and sitatunga. Families of hippo hide in the deeper channels and lagoons, while the unique Delta environment supports many minute but beautiful species, including multicoloured frogs and incandescent dragonflies. 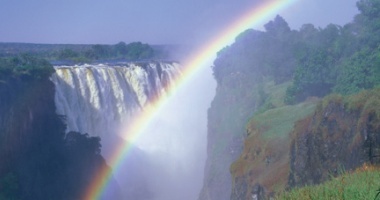 The area supports the continent’s largest surviving concentration of elephant and buffalo, while roan and sable antelope roam the open woodlands. &Beyond Nxabega means place of the giraffe and these animals are abundant in the surrounding areas. One of the most common antelope in the Okavango, the red lechwe is especially adapted for the swampy conditions it lives in. Its splayed, elongated hooves give it a sure footing, allowing it to inhabit the outskirts of the permanent swamps. The Okavango is also a stronghold for the endangered African wild dog, although sightings of this rare animal are relatively uncommon. Exhibiting a fascinating social structure, wild dog live in packs led by a dominant pair, with a strict social hierarchy. Although particularly nocturnal and difficult to spot, leopard live in the dense riverine thickets of the Delta. With an incredible wealth of species, the Okavango is a haven for birding enthusiasts. One of its most sought after species is the huge but elusive Pel’s fishing owl, which roosts in the densest evergreen thickets. A quintessential African sound, the haunting call of the fish eagle can be heard echoing over the channels of the Okavango. The Delta also boasts the largest population of the endangered wattled crane, a large and beautiful species. The African jacana, with its extraordinarily long toes, skims along the top of floating vegetation, giving the impression that it is walking on water. Thrill to an aerial view of the Okavango Delta as you soar above a vast maze of both permanent and fleeting waterways. Fly over rivers and pools dotted with lily pads, as well as a variety of wild animals that inhabit this unique habitat. Additional costs apply. The Delta is probably best known for its Mokoro rides. These are boating trips through the maze like channels and shallow lagoons of the Delta. They are conducted in traditional boats which are called Mokoros. These sturdy boats used to be hand crafted out of large Delta trees. Today most of the boats used in the Delta are fiber glass replicas, to prevent the cutting down and depletion of the Delta’s magnificent trees. Mokoros are a great way to go game viewing. As they are not motorized, they allow you to glide silently through the channels. This allows you to approach the wildlife silently and you will see more, as they are not scared off by a motor. You will see many animals that feed on the grass and reeds on the palm islands such as lechwe, sitatunga, elephant, hippo and crocodile. No additional cost. Game viewing is also offered in motorized boats. These trips allow you to cover more ground, and should allow you to see more of the landscape. No additional cost. 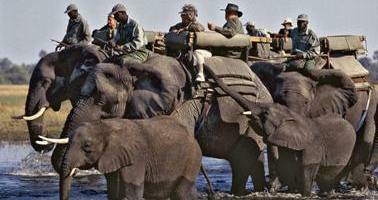 Game viewing in the Okavango Delta is remote and secluded, with very few vehicles sharing the private concession. Sensitive off-road driving practices allow our guests to get up close to the area’s exceptional wildlife. Afternoon drives continue after night, allowing for an opportunity to see the many animals that are more active at night, including leopard and serval. 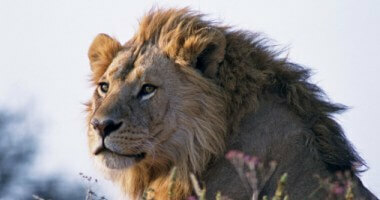 Lion frequently hunt at night and there is always a chance of coming upon them feeding on a kill. Accommodation Rates:- From $650 per person per night sharing. Please contact us for a quote and suggested itinerary.